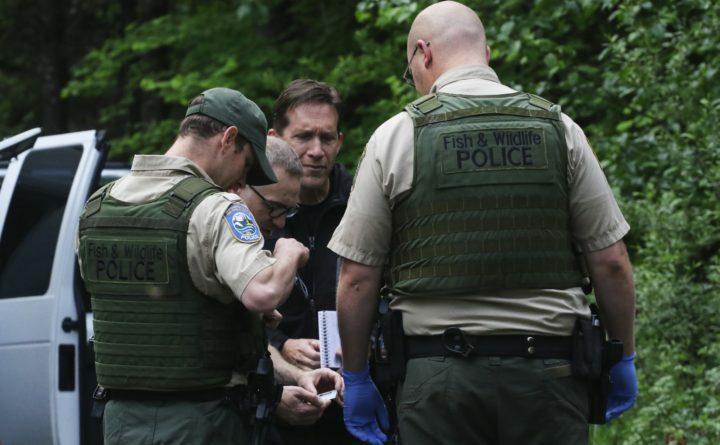 Washington State Fish and Wildlife Police confer with an individual from the King County medical examiner's office and a King County sheriff's deputy on a remote gravel road above Snoqualmie, Washington, following a fatal cougar attack on Saturday. One man was killed and another seriously injured when they encountered a cougar Saturday while mountain biking in Washington state, officials said. The two men, in their 30s, were mountain biking near North Bend, a foothills town about 30 miles from Seattle, about 11 a.m. when they realized a cougar was chasing them. Capt. Alan Myers, of the Washington Department of Fish and Wildlife Police, told KIRO that the men made loud noises — something that authorities recommend people do during such encounters to drive the animals away. But as the bikers were catching their breath, the cougar lunged at one of them and latched on to his head.